Look to your left. Then to your right. If you’re in a public space, you’re 80% likely to be looking at someone with a smartphone in his or her pocket. Statistically, nearly half of them are iPhone users; almost all of the rest will be Android users. Android is huge. It is the world’s most pervasive operating system, with Google regularly boasting stats like “One billion devices,” and “Hundreds of millions of customers” as if they were announcing a new feature of Google Slideshow. As we’ve learned, things change quickly in the mobile market. Motorola, the once-dominant player in the game, is having its roads resurfaced after years of slow, grinding decline. What is learned under the guidance of Google itself, which owned the smartphone maker for two years, it has brought over to Lenovo, its new overlords. And the first few products under that umbrella, the Moto X Play, Moto X Style and, what we’re reviewing today, the Moto G 2015, are all indicative of the kind of relentless focus on iteration we’ve come to expect from this new, mature company. 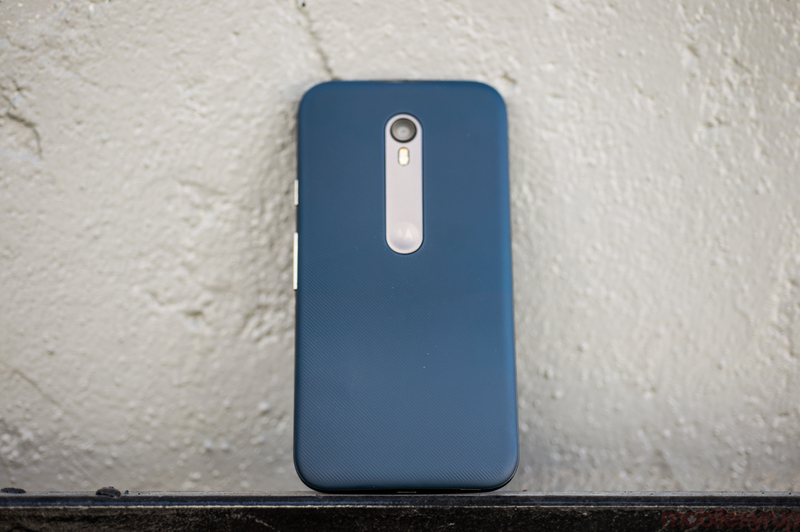 It’s difficult to talk about the new Motorola without talking about the Moto G, its most popular smartphone. Over three generations, the company has honed its craft, producing commendable Android experiences for prices often a third that of competing devices. Corners are cut to attain that price, but those sharp edges are now filed to innocuous curves. It’s no longer true to say that the Moto G is a great cheap smartphone; in its third generation, the Moto G is a great smartphone, period. 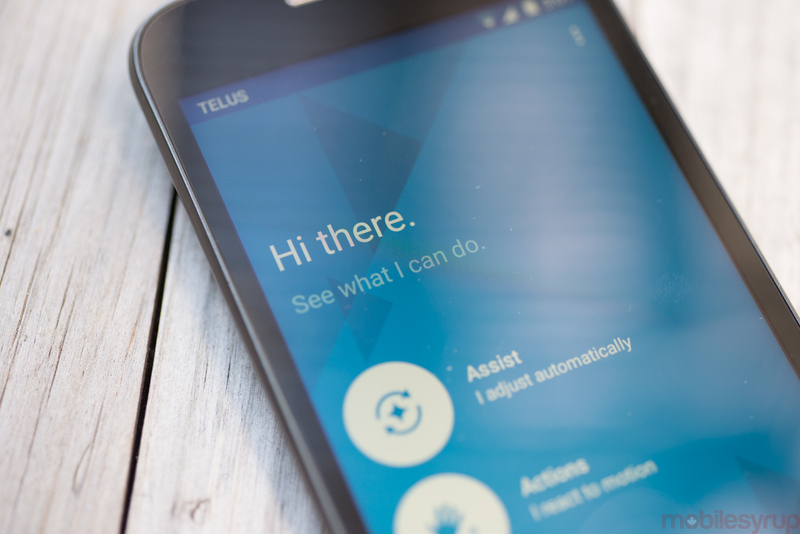 This review was written after testing for two weeks an unlocked Moto G on the Telus LTE network. The device used was the same version being sold by Canadian carriers, and features 1GB of RAM and 8GB of internal storage, with 4GB available out of the box. 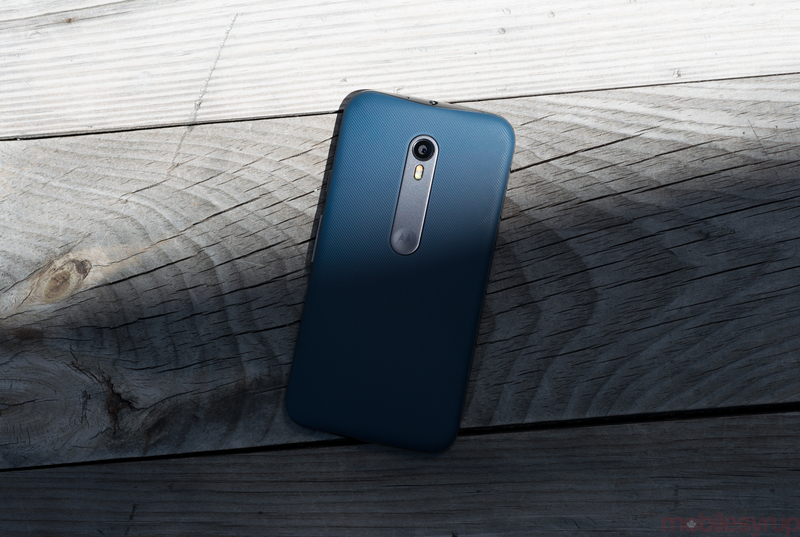 Moto G’s two previous models always towed the line between simplicity and design scarcity, with the more expensive Moto X benefiting from the more generous nature of a high-margin flagship. But in its third iteration, the Moto G is no longer a utility belt; it is, for all intents and purposes, the same phone as the Moto X Play in a smaller body. Subtle curves on the top and sides meet a removable textured back that can be, as with prior generations, colourfully adorned. My review unit had a lovely teal back that I grew quite fond of. 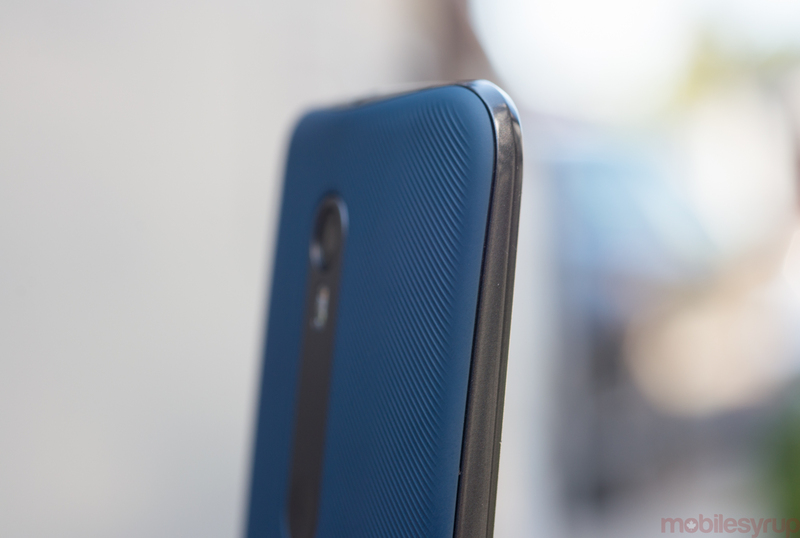 To keep costs down, the Moto G is still framed in plastic, though there is a strip of aluminum down the back to house, and accent, the 13MP camera sensor. For a $200 phone, it is remarkably well made, and the company even saw fit to add IPX7 water ingress protection this year, though you’ll have to ensure that the finicky rear cover is uniformly snapped into place. I almost learned that lesson the irreparably hard way. Holding the Moto G is as comfortable as ever, though the phone is slowly, generation upon generation, sneaking into that too-big-to-use-with-one-hand realm that companies seem to find irresistible. It’s still compact, but I’ll admit to having a bias for slightly smaller-screened devices and wish that it maintained the 4.5-inch screen size of its first generation. Curiously, too, the bezel around the display is actually larger in this version over the last one, likely a consequence of waterproofing. 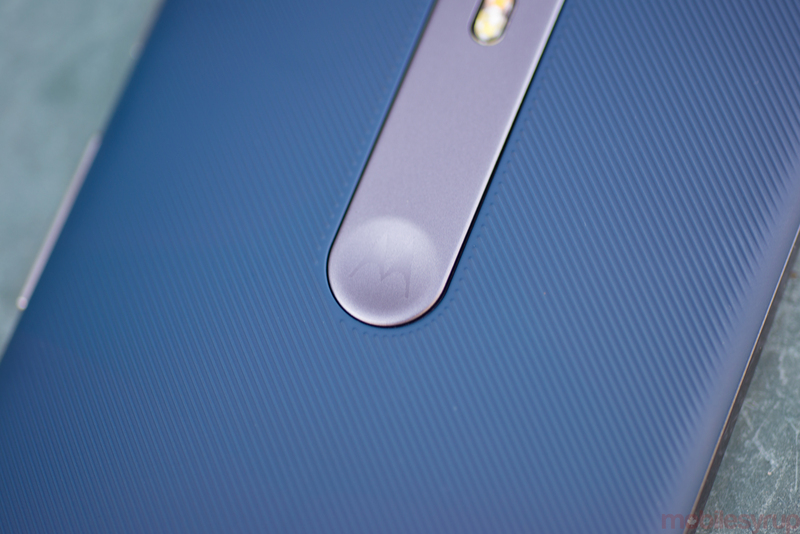 Motorola has addressed some of that malady by rounding out the edges of the phone’s rear casing. Along with the graciously-textured back, the corners now slope to meet the phone’s bezel, resulting in easier entry into a pocket and more security in the hand. It’s a small but important thing that simultaneously boosts perceived and actual value. I do understand why Motorola bumped the screen to five inches in its second generation, and admire that the company kept it there for this one. While the 1280×720 pixel resolution is unchanged from last year’s model, the quality of the LCD panel is markedly improved, with brighter, more vibrant colours, wider viewing angles, and a contrast ratio that keeps black levels within acceptable levels, which is important for reasons that will become clear shortly. Still, the screen is the phone’s minor weak spot. Compared to devices just $100 more, it’s clear this is where the company chose to cut back. Most buyers won’t be bothered the muted greens and washed-out outdoor performance, but it’s something to keep in mind when this is a gadget to be looked at for hours every day. One area clearly improved over last year is LCD efficiency, since Motorola saw fit to add Moto Display, its remarkably useful notification preview system, to this year’s Moto G. Lifting or moving the phone slightly will trigger sensors in the phone to briefly display the time and any unread notifications. The company originally accomplished this using OLED, which activates only the pixels necessary on black screen; now all of Motorola’s phones, including this one, use backlit LCD panels that require the entire display to turn on. As we’ll see later, Moto Display has a negligible effect on battery life. Internally, Motorola kept many elements unchanged in this year’s Moto G, but a significant upgrade comes in the processor, which sees a boost from a Qualcomm Snapdragon 400 chip to the more powerful and power-efficient Snapdragon 410. Still quad-core, the Snapdragon 410 is a 64-bit chip with a much-improved graphics capabilities and integrated LTE. Such improvements may be cold comfort for those looking for more memory, but despite the presence of a model with double the RAM and storage, Canadians can only purchase the version with 1GB of RAM and 8GB of storage. As with previous models, that storage can be augmented with a microSD slot, but despite Android 5.x’s improvements in this area, offloading apps and games to an external card is still a tedious, manual process that most people will hate being forced to do. The main problem with the entry-level phones like the Moto G maintaining 8GB of storage as standard is that it ignores the progress of Android as a platform. Compared to two years ago, both the apps and the operating system on which they run are significantly larger; out of box storage on the new Moto G is some 4GB. Moreover, many of the largest pre-installed apps can neither be uninstalled nor moved to the SD card. Most of those come from Google, but it’s at developers’ discretion whether to allow the practice at all, and many choose to prevent it. 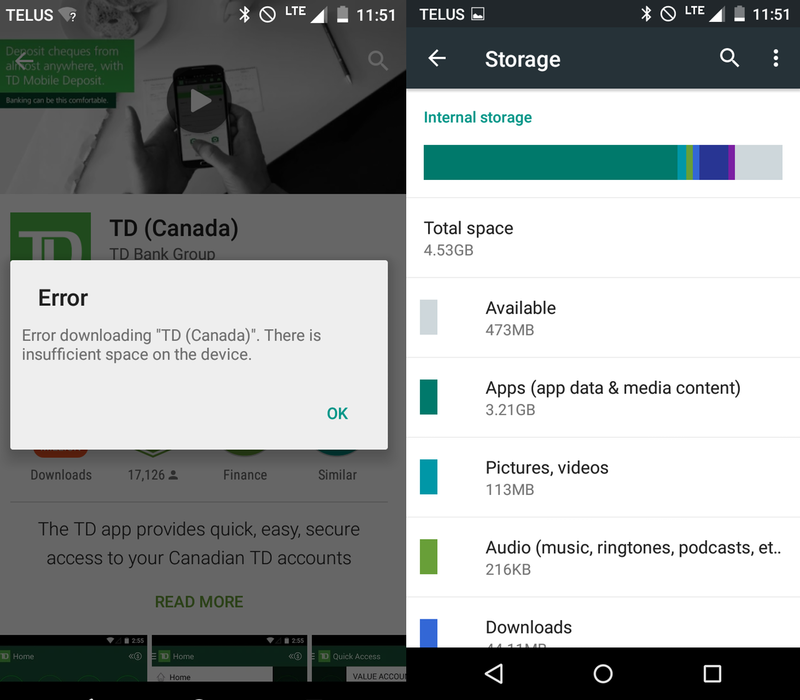 Some larger apps that do allow for offloading to external storage only transfer about half of its contents, so a 200MB app is reduced to 100MB on the main trunk. A 50% reduction, sure, but an awkward manual practice nonetheless. Considering there is no way to force every new app to external storage, companies’ reliance on external storage to stay criticism is both dishonest and impractical. I purposefully kept the number of apps I installed on the phone to a minimum, counting as important only those I consider compulsory on a new install: Slack, Twitter, Instagram, Newsblur, NYTimes and a few others. It didn’t take long before I was told that there was insufficient storage to continue installing, or even updating, apps, sending me back into the dreaded App Settings menu to finagle a bit more blood from this limited-storage stone. 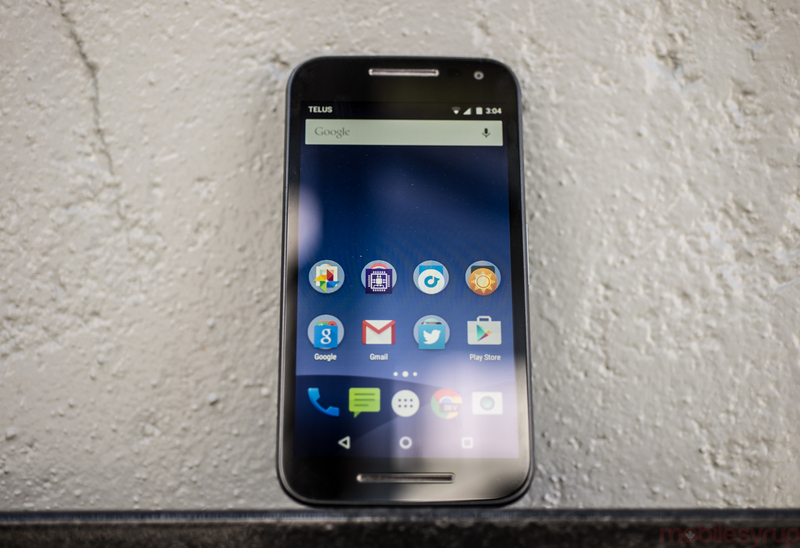 The good news is that the Moto G remained fast and lag-free throughout my time with the device. It’s well known in certain crowds that Google overcame some memory leak issues in earlier versions of Android 5.0 Lollipop, but with Android 5.1 those seem to have been fixed. Of course, longer term the Moto G may begin to slow, as many Android devices do, but try as I might, I couldn’t find that precipice. Indeed, I was constantly amazed as how consistently capable this phone was; very little separated its core competencies from that of a Moto X or, say, a Galaxy S5. It certainly punched higher than its proverbial weight class in almost every regard. Much of that grace, and good will, can be attributed to Motorola’s belief in only minutely changing stock Android, adding well-regarded gestures, and the aforementioned Moto Display, to a version of Android 5.1.1 that many would consider its ideal form. 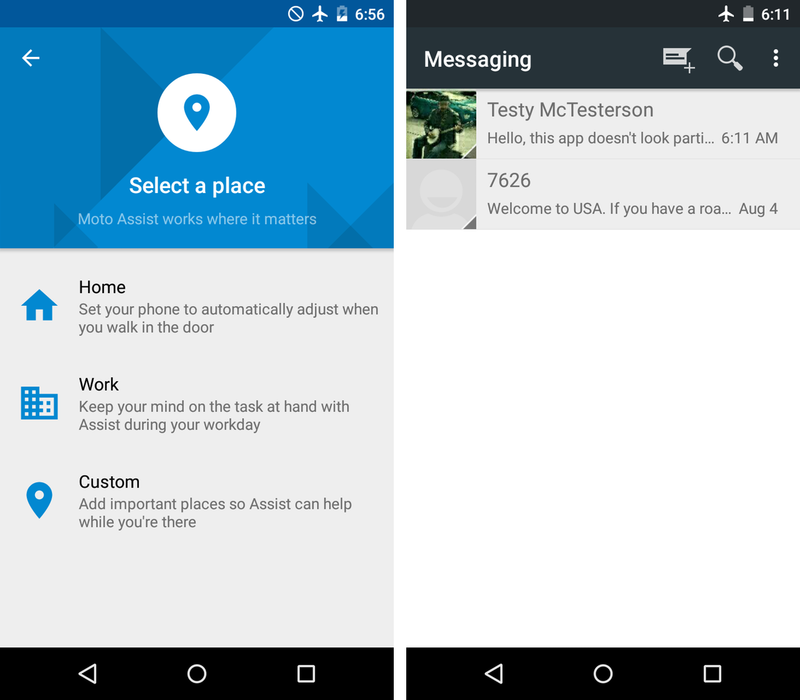 This year, Motorola has added a few notable improvements to its Moto Assist portal, which now supports custom locations, and a smart camera mode that automatically parses information from business cards and QR codes. And while it still lacks the Moto X’s always-listening voice controls, which after three years I’ve found to have dubious usefulness, the well-loved “twist twice to open camera” gesture has made its way down the supply chain. 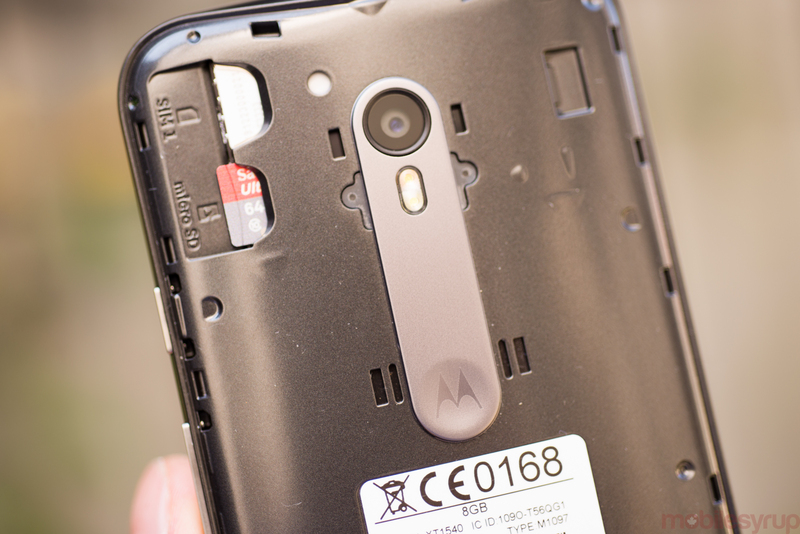 Storage woes aside, there is little to fault the Moto G for in this section. The software is clean, untarnished by bloatware or annoying first-party apps. 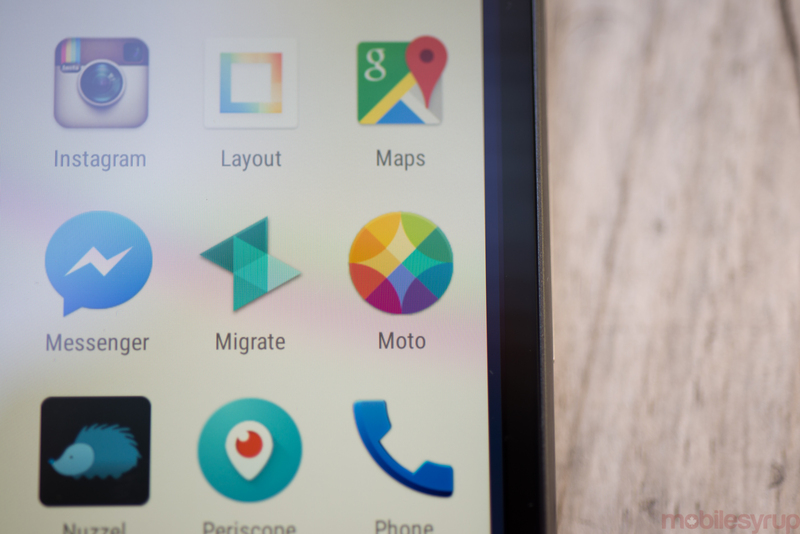 Motorola errs on the side of Google services, which means that, unlike on a Samsung or Sony device, users don’t have to compete with duelling cloud services. Advertised as this year’s killer feature, the Moto G’s camera is indeed a big improvement over previous models, both in terms of resolution and overall quality. 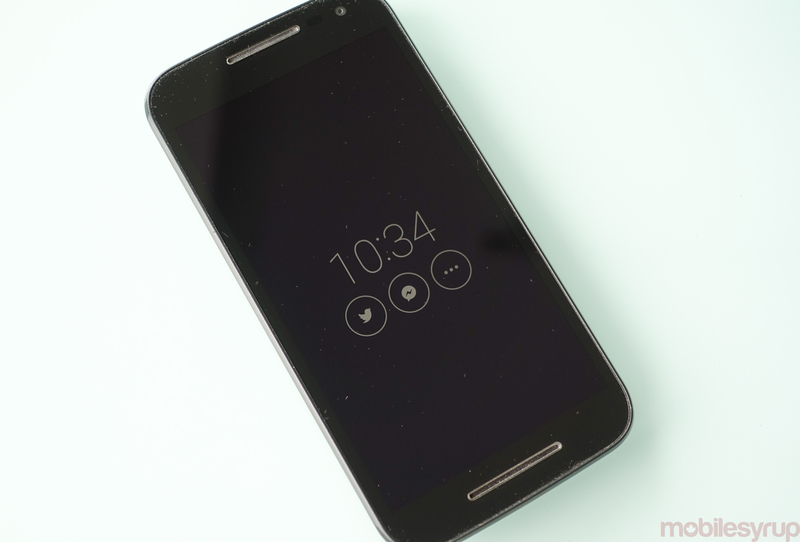 Much ado has been made about its sensor, the same one found in the Nexus 6, but that doesn’t tell the whole story. The phone also has an F2.0 lens and dual-tone LED flash, which puts it on par with devices double or even triple its price. Sharing a sensor with the Nexus 6 is a dubious distinction, since it is also nearly identical to that of last year’s Moto X, with both devices courting criticism for their poor low-light performance and inconsistent and often vexing daylight exposition. It turns out that what we criticize on a $500 or $700 phone, we forgive on a $200 one. And while the phone won’t win medals for clarity or dynamic range, it is one of the, if not the, best cameras in its price range and slightly beyond. 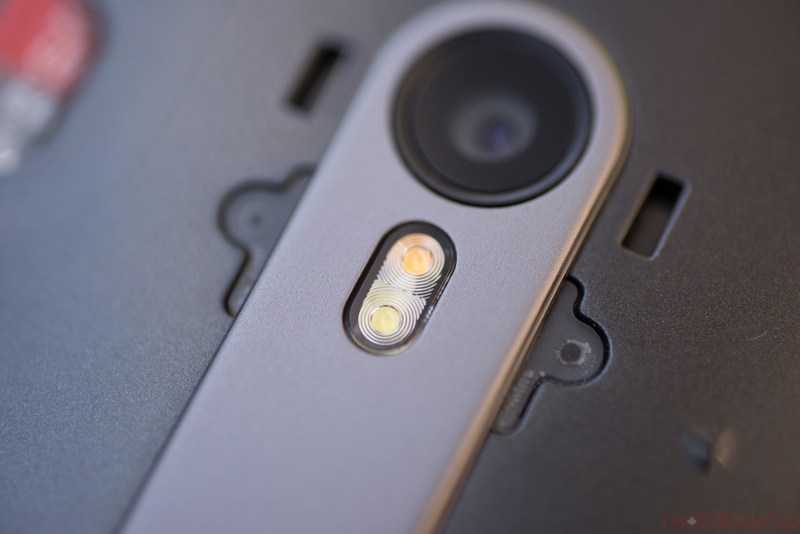 I’ve long been a fan of Motorola’s elegantly simple camera app, and it streamlines the photo-taking process with its tap-to-focus-and-shoot mechanics. Most of the time, thanks to that F2.0 lens, the photo turns out decently, though it takes a moderate amount of light to fix that wandering focus mechanism. In daylight, the Moto G manages to take well-exposed, relatively sharp photos that, upon closer inspection, have a modicum more artificial sharpening around the edges than I’d like to see from a device like this. The upside is this: if you’re just looking to grab some photos and post them to Instagram or Snapchat, the Moto G will perform beautifully, and far better than last year’s 8MP-equipped model. If you’re looking for a smartphone with a camera that can turn in beautiful, clean digital images for scaling up, look elsewhere. This is good, but it’s not that good. In darkness, things get a bit more nuanced. The Moto G has terrible low-light performance, but that’s by design; Motorola has limited shutter speed to 1/15 (one fifteenth of a second) to limit blur, and light sensitivity to ISO 1250 to minimize grain. Both work together to minimize photos with either blur or grain (good), but result in photos with little to no usable detail in darkness (bad). Fortunately, Motorola has added a couple of pseudo-manual features that allow more discerning users to bypass those limitations. An exposure slider raises the maximum ISO to 5000, but that quickly exposes the myriad limitations of the sensor itself. A dedicated Night Mode keeps shutter speed as low as possible while raising the maximum sensitivity to 2000, even when the sensitivity slider is at maximum. In other words, Night Mode merely increases the sensitivity threshold without exposing the sensor’s seams. Neither one makes up for the fact that the sensor is just plain bad in low light. The same issue was present on the 2014 Moto X, which we were told by a Motorola product manager had something to do with encouraging customers to use the flash. “Customers told us they didn’t like blurry or grainy photos,” I was told. Unfortunately, creating artificial light is neither feasible nor commendable in many low-light situations, creating harsh shadows and uneven skin tones. The dual-tone flash on the new Moto G is certainly better than what we’ve seen from the company to date, but it doesn’t make up for the seemingly-arbitrary camera limitations. The complete lack of any manual mode in the camera app compounds the severity of the situation. For those in the selfie game, the front-facing camera has also been given a boost, from 2MP in the previous generation, to 5MP here. As selfie shooters go, this one is run of the mill, but the extra resolution is put to good use in daylight. As with most front-facing cameras, things start going south past sundown. 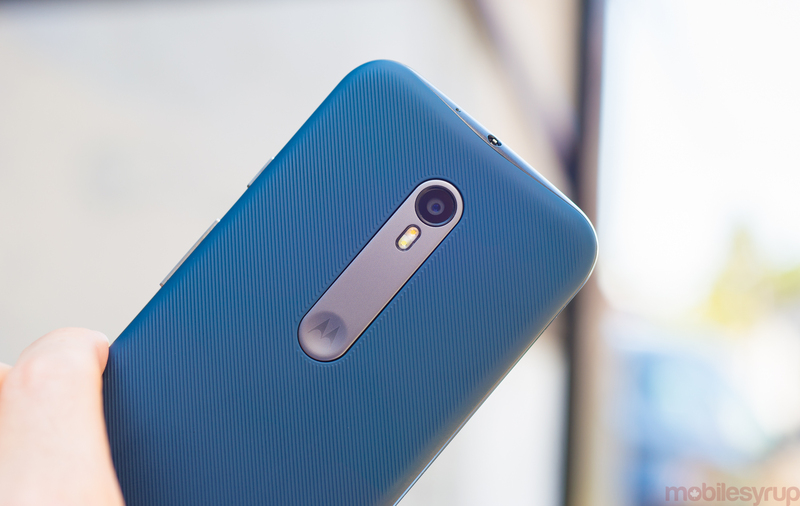 Finally, after three generations the Moto G can now shoot video at 1080p. It’s limited to 30 frames per second, and the quality isn’t up to par with most flagships, but it does a competent job picking up movement and sound, and that’s all you need to share video to Facebook or Twitter. Battery life is one aspect of the new Moto G that I can wholeheartedly praise. Already a workhorse in its first and second generations, the new model increases capacity 20% from the previous version which, coupled with a more efficient processor and screen, gave me roughly 40% more battery life. 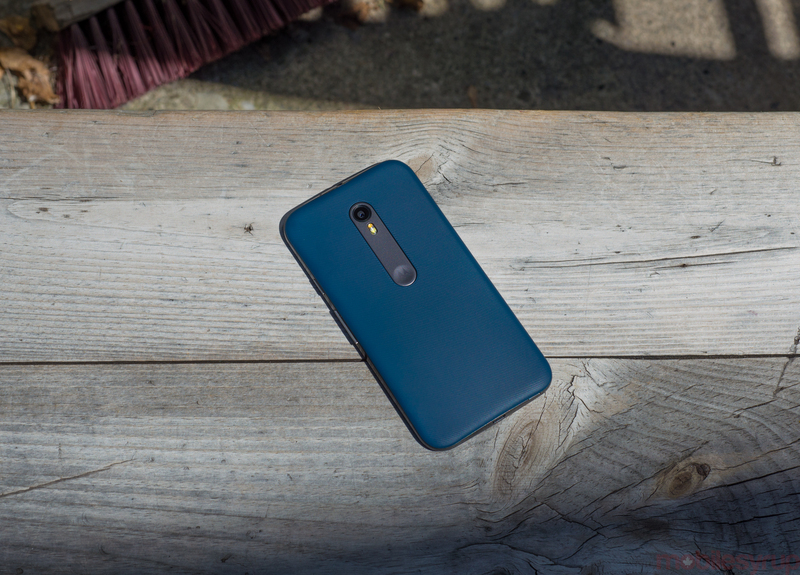 The second-generation Moto G already lasted me a whole day per charge, and this one easily trumps that. I’m not saying it’s impossible to kill this thing before 9pm on a busy day, but I had trouble getting it close to 20% by the time I fell asleep. The battery isn’t removable, though, but that’s for a good reason: Motorola added IPx7 water ingress protection to this model, allowing it to be submerged in three feet of water for up to 30 minutes. That is, as long as the back cover is correctly installed. While the phone isn’t immediately usable while it’s drying off, that you can refer to, say, a map in the rain, or prevent a trip to the repair store when it’s dropped in the sink, is a very reassuring feature. Added to its already-robust plastic frame and replaceable back covers, this phone should last longer than its price would lead you to believe. Hell, buy two if you’re worried; the total cost would still be less than a single flagship from Samsung or LG. Thankfully, the third-generation Moto G also comes equipped with LTE support, something its predecessors lacked, at least not without explicitly hunting down the correct SKU. 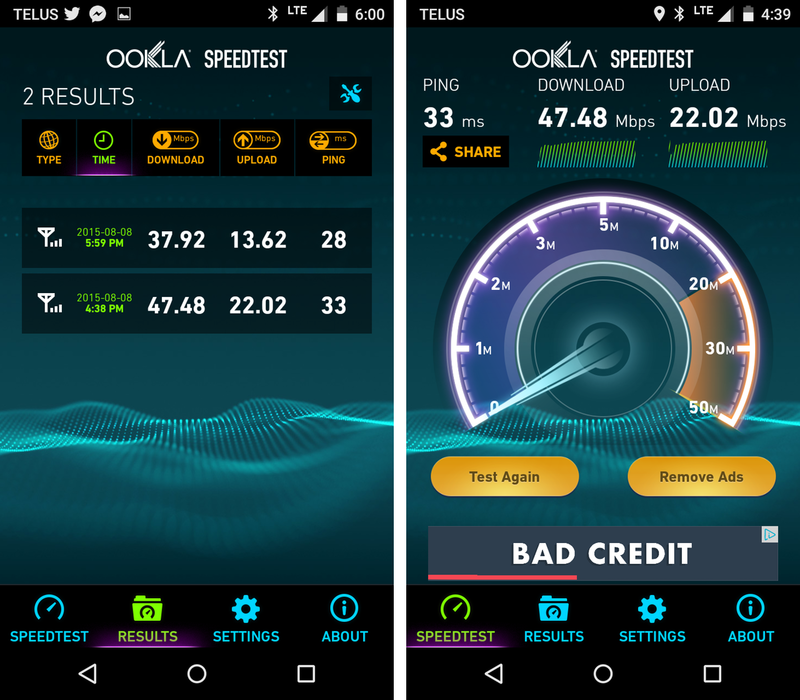 I used the Moto G on Telus’s LTE network and obtained fast, reliable service in both Vancouver and Toronto. Call quality, as expected from a Motorola device, was on the high end of clarity, though until more carriers and devices support VoLTE calls will continue to sound like they originated under water (which this phone could technically accomplish). 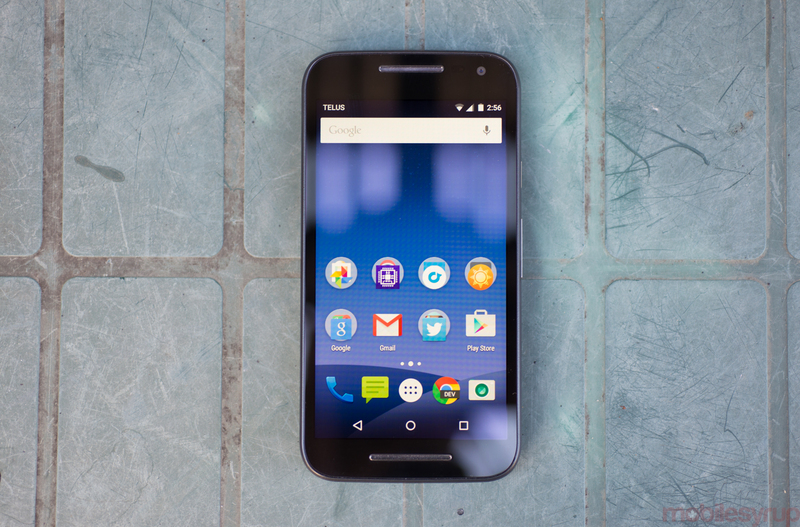 On paper, the the new Moto G features an unfortunate regression: the device only has a single forward-facing speaker. Much was made about last year’s dual-speaker setup, but in reality the drivers were underpowered, and set too narrowly apart, to affect a real stereo soundstage. Comparing the two devices side by side, this year’s model, despite its single mono speaker, is both louder and less prone to distortion. In other words, it’s an upgrade despite the regression. Perhaps more troubling is that the Moto G still lacks NFC support, and can’t connect to 5Ghz WiFi networks, an increasingly common standard in a world of 2.4Ghz signal rot. The world of entry-priced phones is becoming increasingly competitive, and it’s more difficult to distinguish between the various quality tiers in the Android ecosystem. Indeed, with the new Moto G starting at $230, one could argue that it will force, as Motorola has done for two years now, other OEMs to drop the prices of their own mid-range devices to compete. Each manufacturer approaches the market in different ways. Samsung takes its flagships and muddies the waters slightly, producing mid-range products that are neither memorable nor worth considering. The same is true of LG. HTC has a decent lineup on its hands, and the Desire 626s, which launched earlier this summer in Canada, is tremendously competitive with the Moto G. It features a slightly more anemic processor in the Snapdragon 210, but makes up for it with 1.5GB of RAM. In the slightly higher price bracket, Alcatel OneTouch has the excellent Idol 3, which is both bigger and more powerful than the Moto G, but is still free on a 2-year contract. Similarly, the excellent but flawed Asus ZenFone 2 costs only a few dollars more than the Moto G and comes with double the RAM and storage, plus a considerably faster CPU. You do, of course, lose out on the excellent software nuances that Motorola is famous for, but if you’re looking for sheer speeds and feeds, the Asus will suffice. In the end, the Moto G is still king of Android’s busiest seaport. Its newest version has enough new features to entice existing users to upgrade, and is robust enough to stand on its own in a delegation of loud and vain merchants. What it lacks in numbers it makes up for in experience, and with a certain amount of patience can be bent to fit most peoples’ lifestyles. It still stings that Canadians won’t be able to buy the more versatile and powerful version, but this one is more than capable, with an inoffensive price to match.